It’s an exciting week on the publishing front! First, over to the right here is Issue #15 of Black Gate — it is hot off the presses and loaded with stories, including my “World’s End.” This is the first publication of any of my stories in the Agondria cycle. 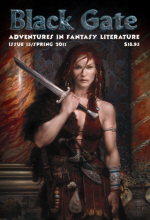 Every issue of Black Gate is like a super-high-quality anthology of sword & sorcery adventure, along with reviews of books, games, an insightful editorial . . . even a cartoon! At 384 pages long, this issue is essentially a book. I am truly honored to be sharing the table of contents with some of the finest writers in the field, including my friend John R. Fultz (who has been interviewed on this blog). Also, I have to tell this story: some months ago, when Editor John O’Neill revealed the wonderful painting he’d purchased for the cover — and knowing some of the stories he’d chosen for inclusion — I remarked to him, “Wow! So this is the Warrior Woman Issue, huh? You chose that cover to match the content!” Actually, he hadn’t — or not consciously, anyway! But he agreed that I was quite right. Sure enough, in the table of contents, he has grouped eight stories into a section under the heading “Special Warrior Woman Issue”! So I had the honor of making one extra contribution to this issue, other than my story — it seems I even helped a tiny bit with the conceptual design (or at least in identifying it)! For fans of Emily Fiegenschuh’s illustrations for “The Star Shard” in Cricket: Emily has recently presented me with her amazing book Journey: Sketchbook Volume 3. It’s a beautiful, 96-page softcover collection of her artwork from around the time she worked on my story. One long section of the book is entirely devoted to “The Star Shard,” including conceptual designs, a motion sequence or two, and variations on the appearances and costuming of the characters. Herein are some of the sketches I got to see when we were still in the planning stages, when we were working out how some things should look. It’s a fascinating glimpse into the pre-production world of “The Star Shard,” though most of the images are quite detailed. One of my favorite pages shows the possible looks that might have been given to Bobbin and Argent. Really cool! For anyone who may not yet know: you can view the images for the story in all their full-color glory — and even order prints! — on Emily’s web site at www.e-figart.com. And now, allow me to change the subject with a monkey wrench: Grrooiinnnkk! A couple weeks ago, some friends from out of town visited me. One highlight of the visit was an opportunity that even many Taylorvillians may not be aware of. 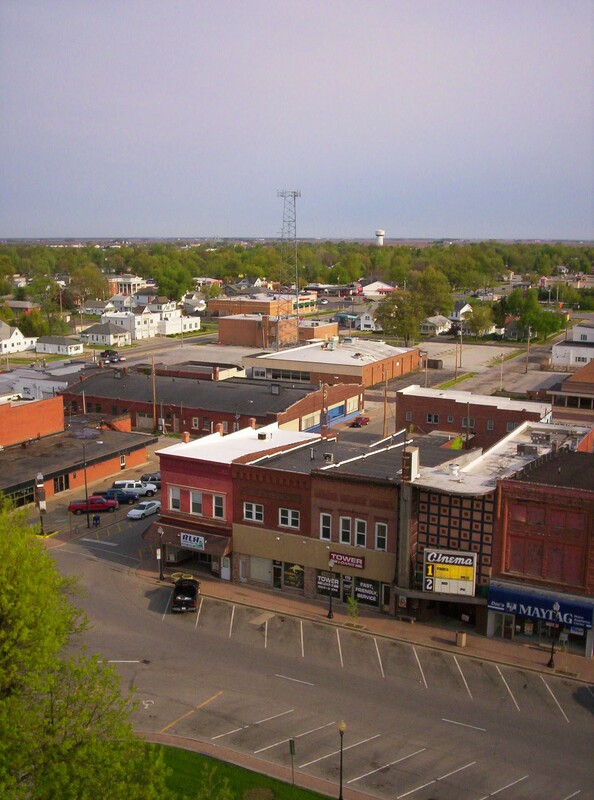 Remember our county courthouse, situated on the Square in Taylorville right behind the statue of Lincoln and the pig? There it is! Well, the man who winds the tower clock once a week is always willing to take visitors along with him. If you can get out of bed to meet him a little before 8:00 a.m. on a Saturday — and if you can climb a lot of stairs — he’ll give you a fascinating tour of this historic landmark. A more knowledgeable guide you will not find. 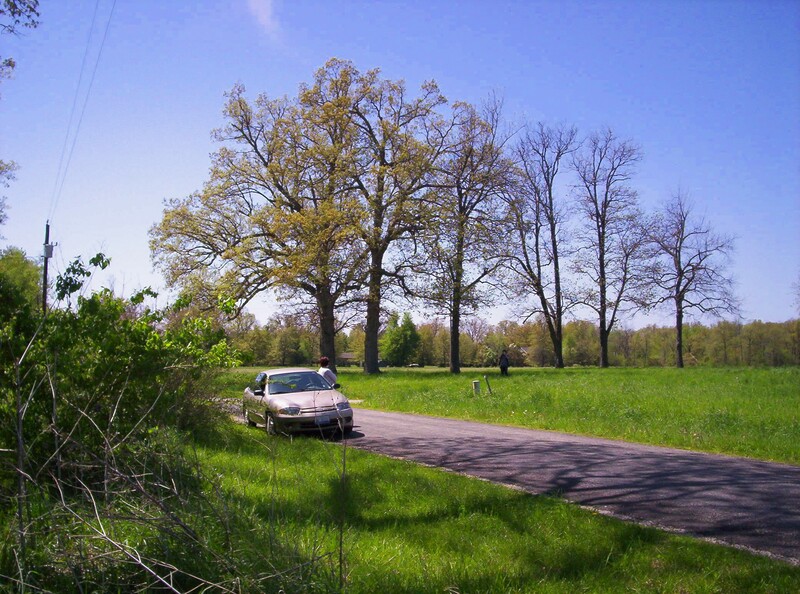 His passion for history and mechanics becomes immediately apparent. Eighteen years ago, he escorted me and some Japanese friends up into the clock tower. This time around, knowing it would be just the sort of thing my company would enjoy, I gave him a call, hoping he was still the Clock Man — and he is! 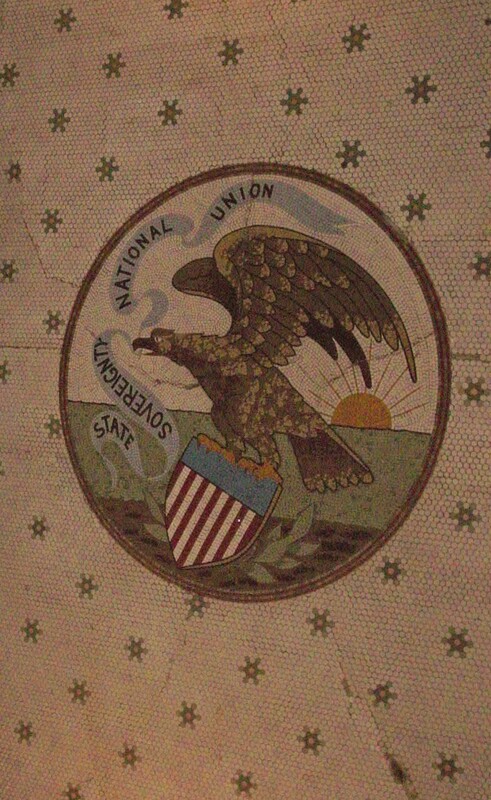 This seal greets you as you enter the courthouse. 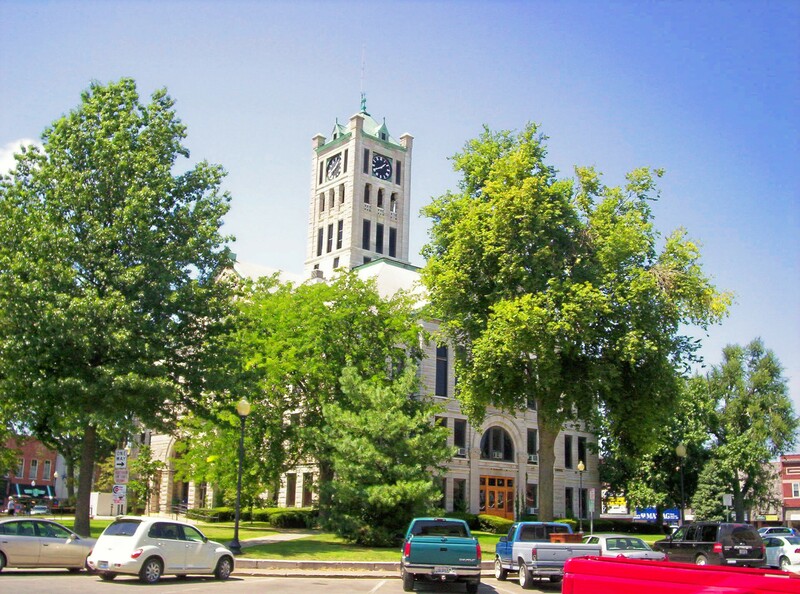 The building itself, constructed in 1902, is the third courthouse of Christian County. 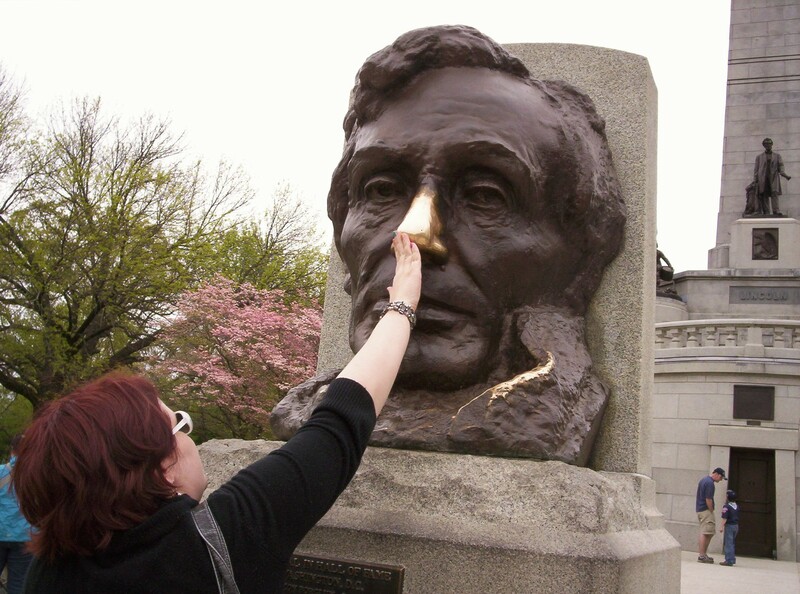 The first, as Lincoln afficionadoes will know, is located now on the grounds of our local historical museum, and is the building in which Lincoln himself practiced law. 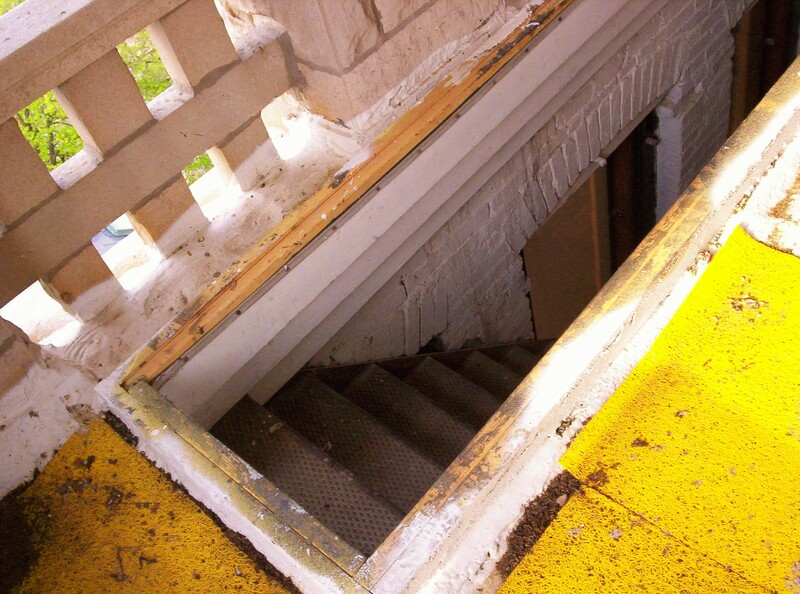 My personal favorite part of the ascent is the journey through the dim attic, behind those roof-parts of the courthouse. It’s like being in a mine, with all the brickwork and dust and walkways. 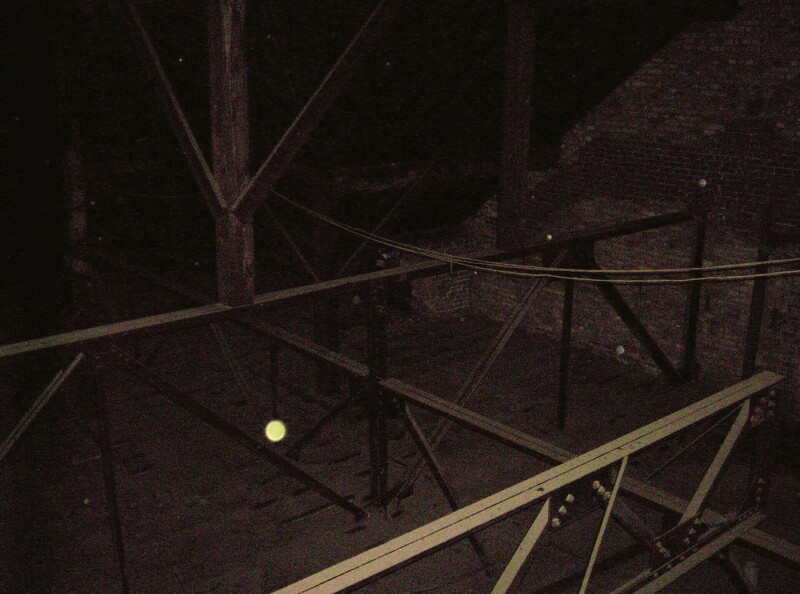 Are those dust-motes in my photos, or orbs? 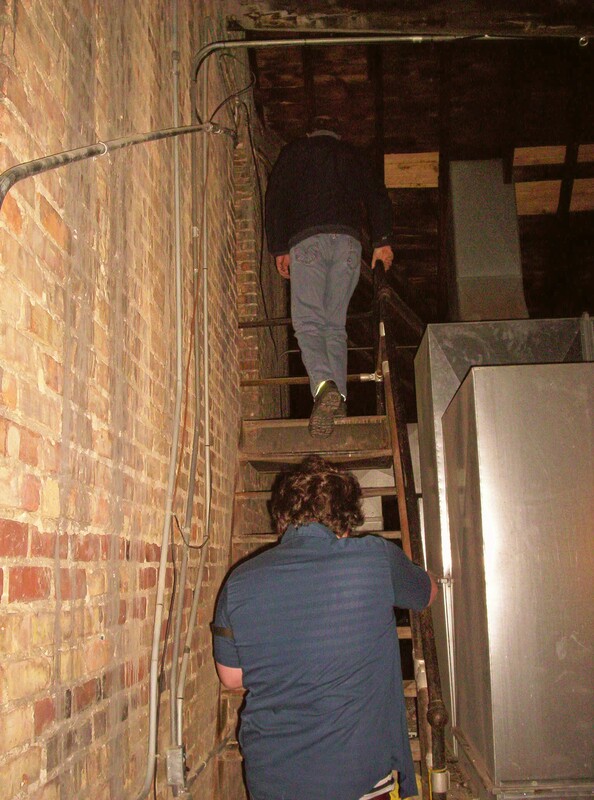 Seriously — I think this attic was an inspiration for the basement stairway scene in Dragonfly. Does the math work out? If I’m figuring right, 1993 would have been when I first saw this attic. Hmm. Iffy, but very close. We’re heading up into the tower here. The wooden walkways really remind me of tourist pathways in commercial caves. 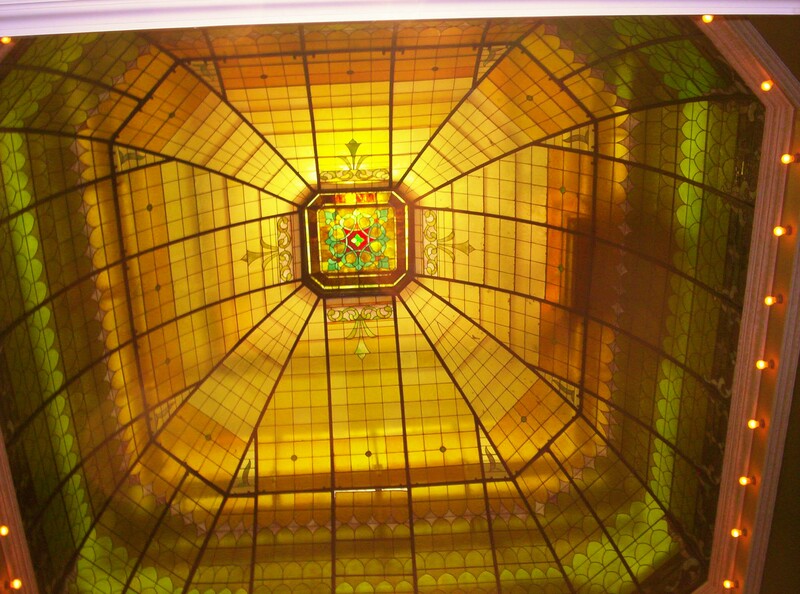 The crowning jewel of the courthouse is a stained-glass dome that for decades was hidden by a false ceiling and all but forgotten. 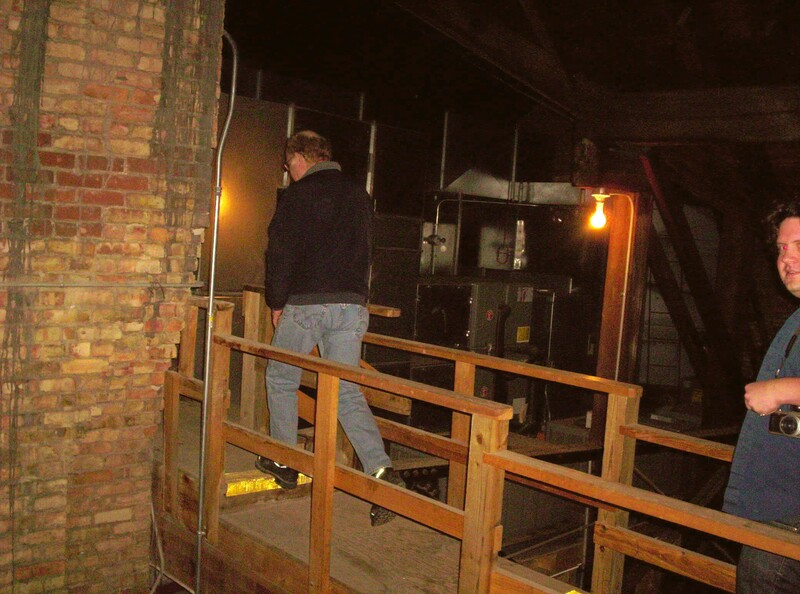 When I made my first trip up into the tower, it was visible in a dark crawlspace, but it was not yet restored. Here, we’re climbing above the dome. You know, this courthouse has inspired two of my short stories as well. 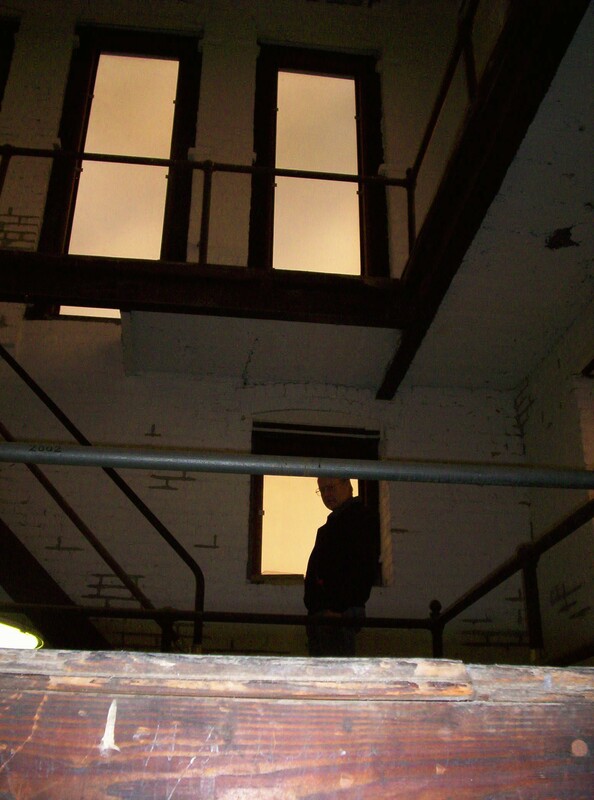 One, an unpublished “learning experience,” was called “Hunting the Vampire,” in which two pre-teen boys (heavily based on my nextdoor neighbor and me) become convinced that a vampire has taken up residence in the courthouse tower. Taking it upon themselves to rid the community of this horror, they break into the courthouse at night and ascend the black tower . . . to a somewhat surprising (if inept) ending. I used to inflict that story on my Saturday English students at Nozomi Lutheran Church. I had study guides to go with it and everything. 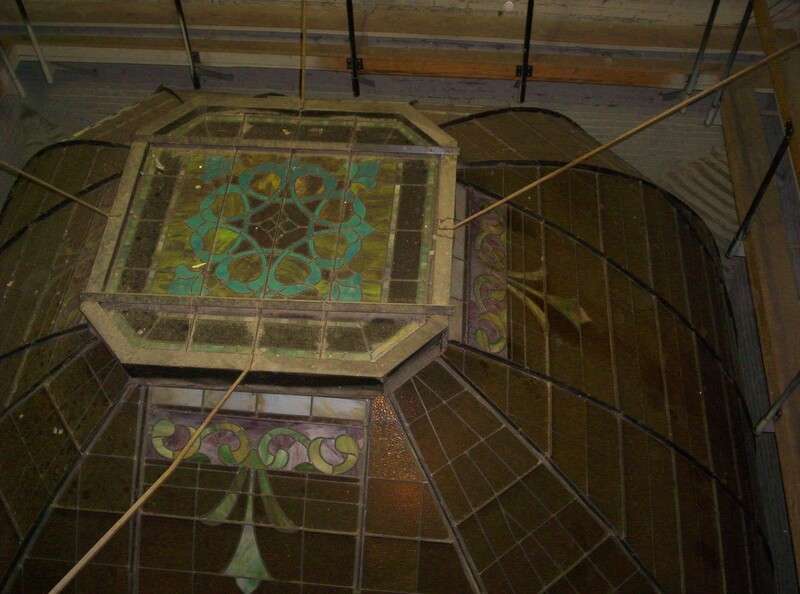 This dome was discovered beneath four feet of dust! That’s a fact, according to the clock keeper, and he would certainly know. The other story set partly in this courthouse is “Witherwings,” in which a young boy gifted with a special “sight” sees horribly disturbing images in the stained-glass dome that no one else sees. I really like that one! Are you okay? Everyone still here? Whew! It’s quite beautiful. 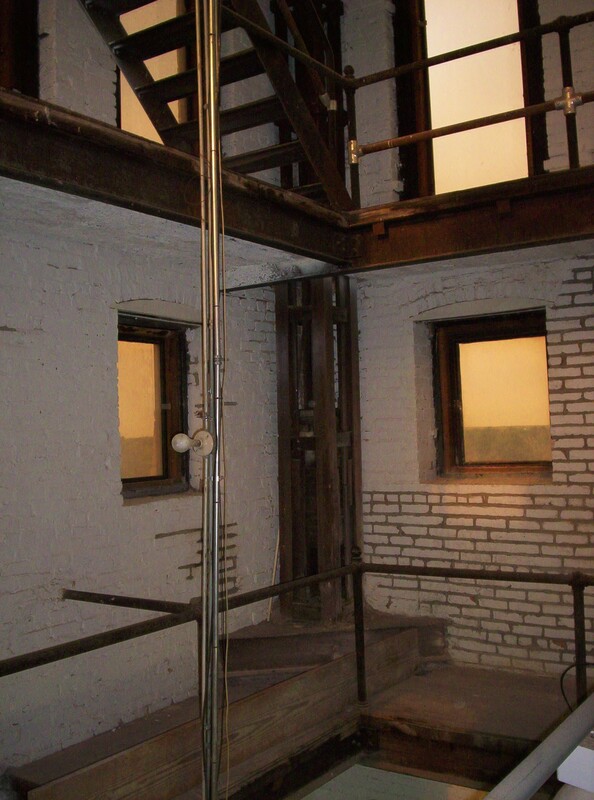 You come up this narrow stairway into that open-air part of the tower that you can see from the ground. That’s where the mighty bell crouches. 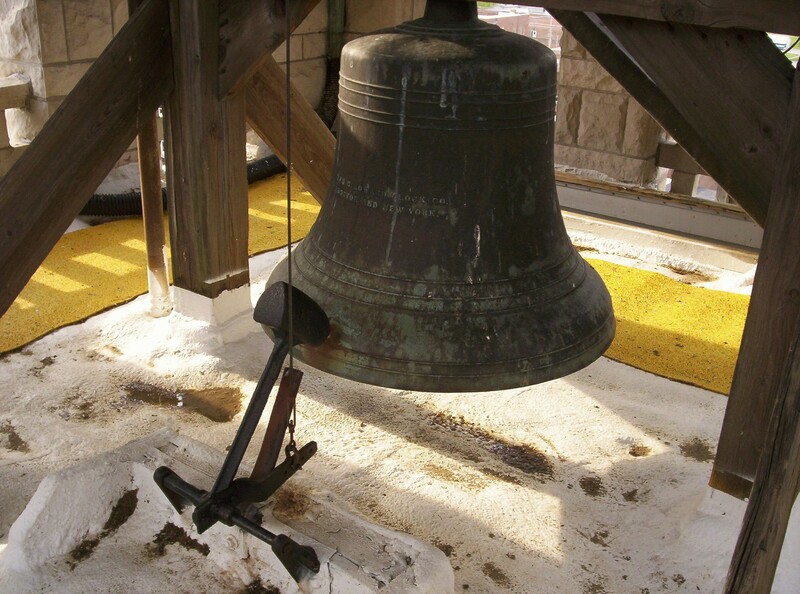 And just as one of our party was kneeling in front of this bell to take a closeup picture, the bell struck 8:00 a.m. That . . . was . . . LOUD. And now we come into the small housing chamber of the grand clock itself. This clock keeper is only the third man to do the job since 1902. Clock keepers tend to be lifers — people who do the job because they absolutely love it. Back in the fifties and sixties, many weight-driven clocks were gutted and fitted with electric motors. Doing so was a travesty. Aside from their historic value, the weight-powered clocks are simply better. They don’t stop during power failures. 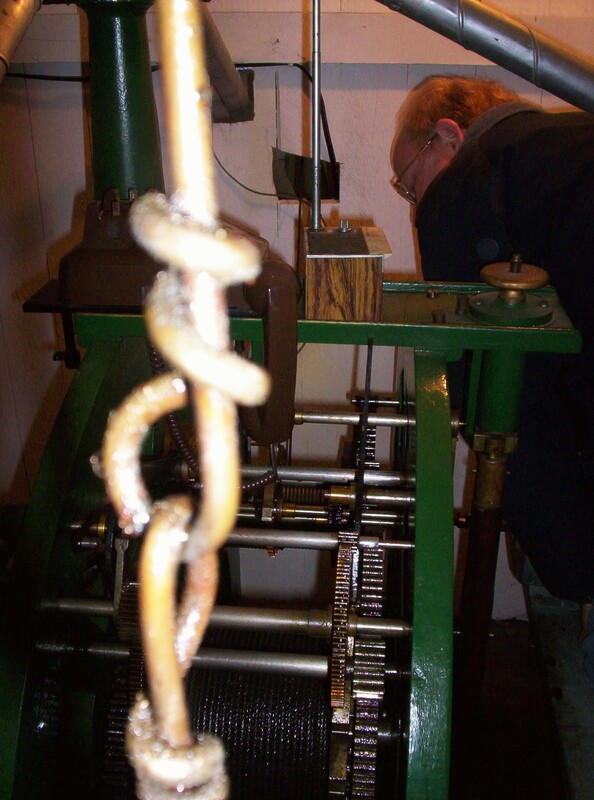 Furthermore, in wintry Midwest conditions, clock hands are often blocked in their movement by snow and ice. When this happens, weight clocks will just stop and wait (Do I have to pay the pun fund?). Electric motors will burn themselves out. Various conditions can affect the clock’s accuracy: temperature, humidity, weather . . . Good clock keepers learn to listen, to know the sounds and rhythms of the mechanics, so that they can hear when something is wrong. Some tiny glitch can occur that may stop the clock many hours later. So if there is a problem, the clock keeper becomes a detective. Did the wind from a certain direction push the clock hand inward just enough to snag on a number on the clock’s face? When might this have happened? And on which of the four clock faces? This week, the clock was running fast by 25 seconds. (It must be wound once a week, at the same time each week.) 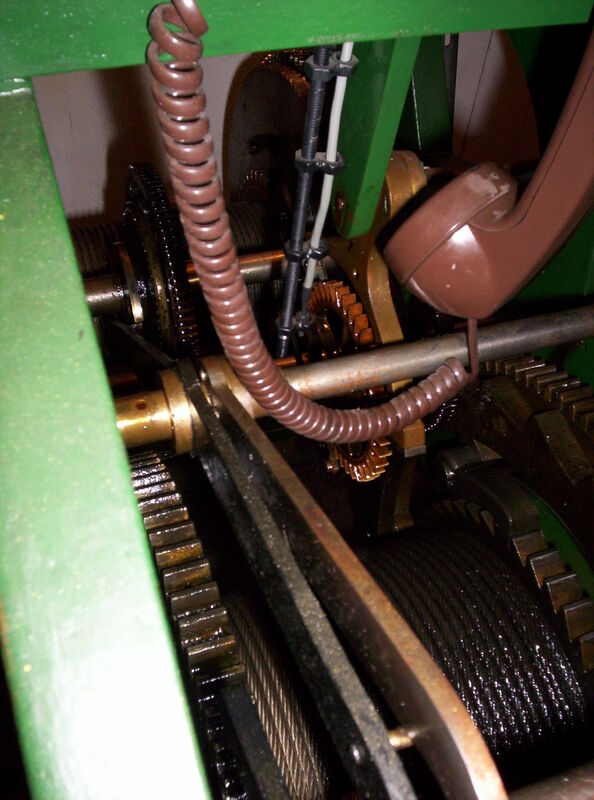 Do you see this telephone atop the clock mechanism? 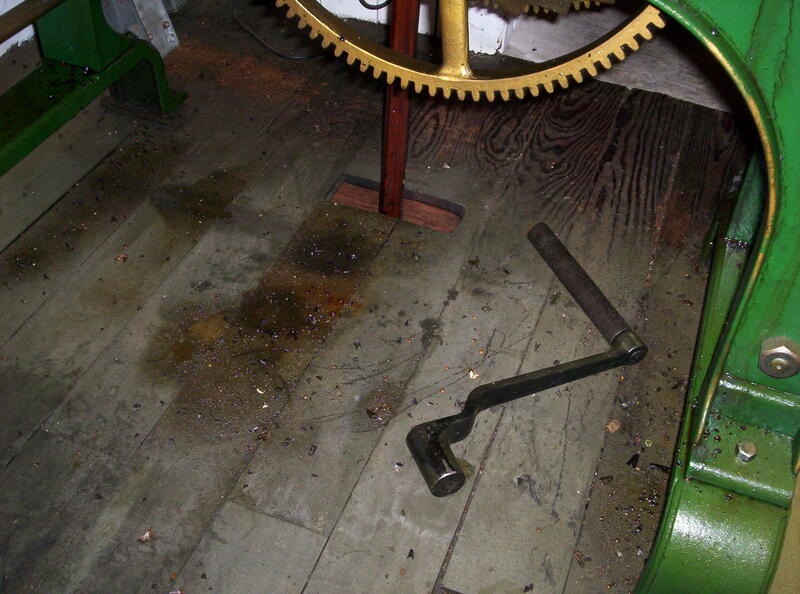 The first two keepers used this crank (above) to wind the clock. 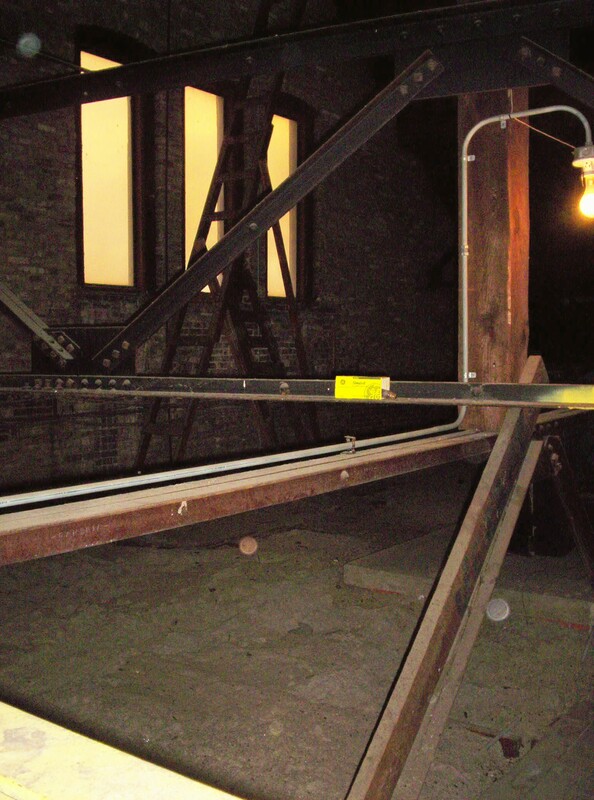 It’s the bell side of the clock that is by far the harder to wind; you have to raise a weight equivalent (in weight, not size) to a smallish car up four stories to wind the striker. 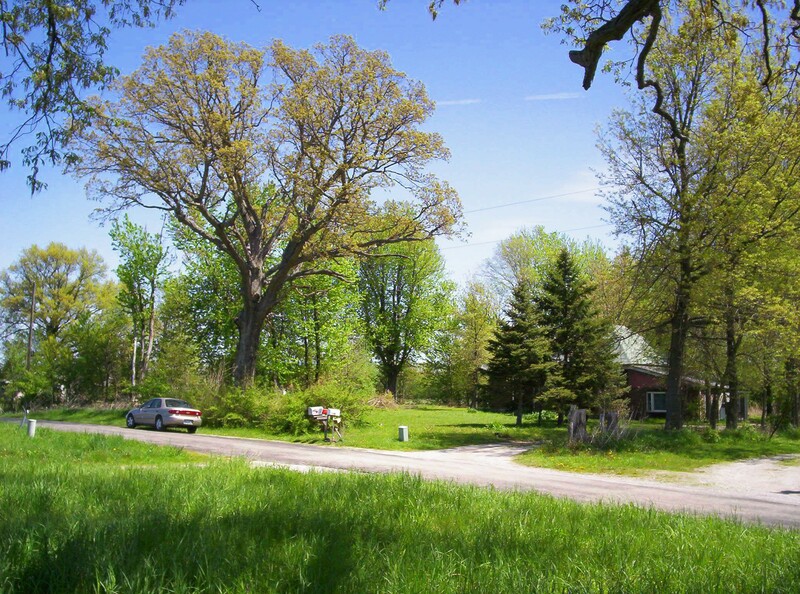 By hand, the process took a good hour, with frequent stops to rest. The current keeper did that once. Then he built himself a motorized attachment, which winds the clock (lifts the weight) in a few minutes. The former keeper did the job until he was in his nineties. 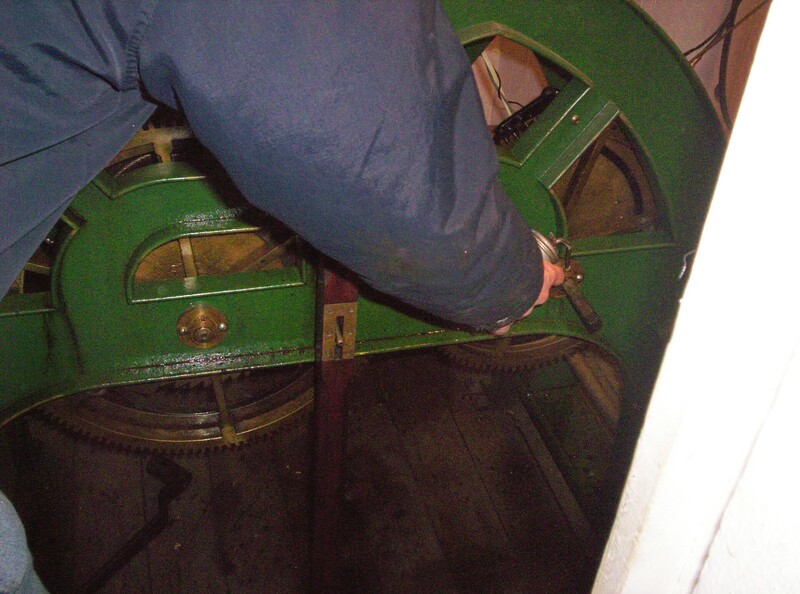 At the time he retired, he could still turn the crank with no problem; it was his knees that forced him to quit. He couldn’t climb all the way up there any more. 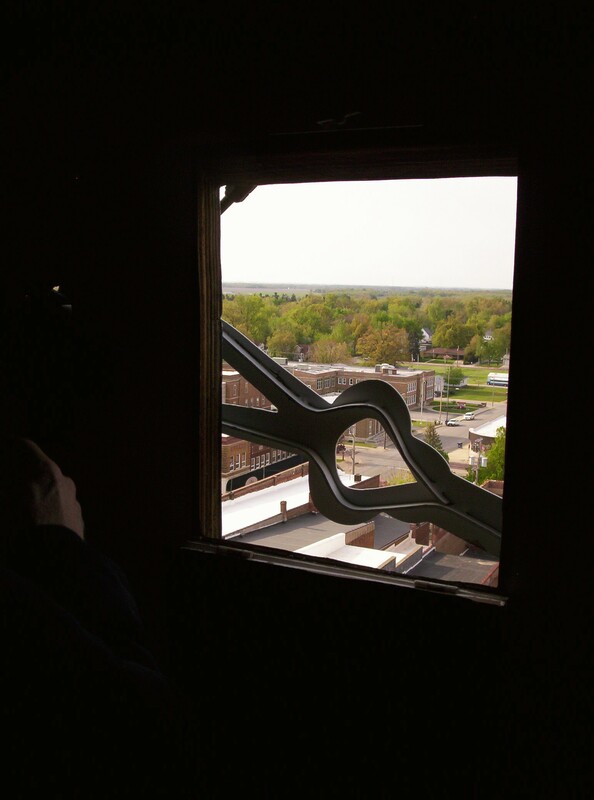 So we’re looking right out through the face of the courthouse clock here! One of the hands is visible. There’s the northeast corner of the Square (above). Look! 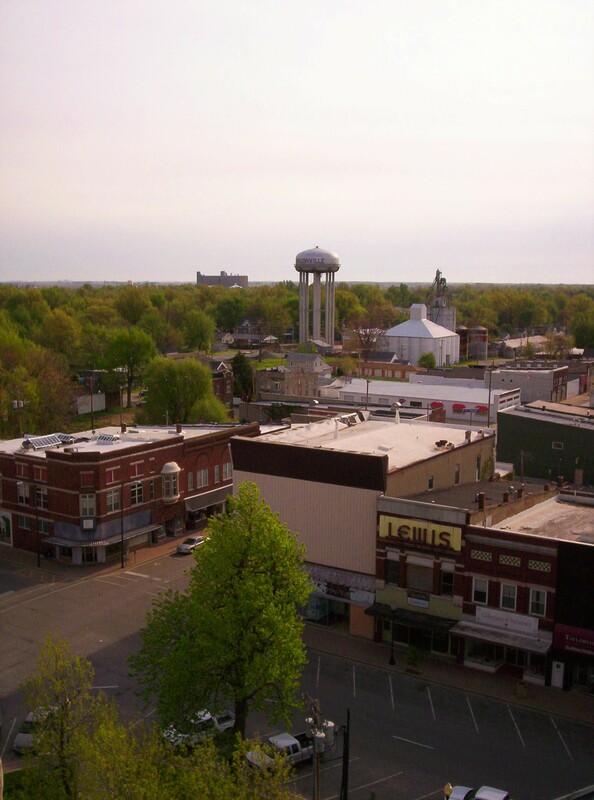 Beyond the water tower is the soybean mill which is visible from my yard, which lies still farther east! There’s the north side, and the movie theater. I can’t quite see what’s playing. Isn’t it odd? Just a few short months ago, I was taking photos from atop a tower on the other side of the world. Strange feeling. These places we know so well, where we spend our lives . . . 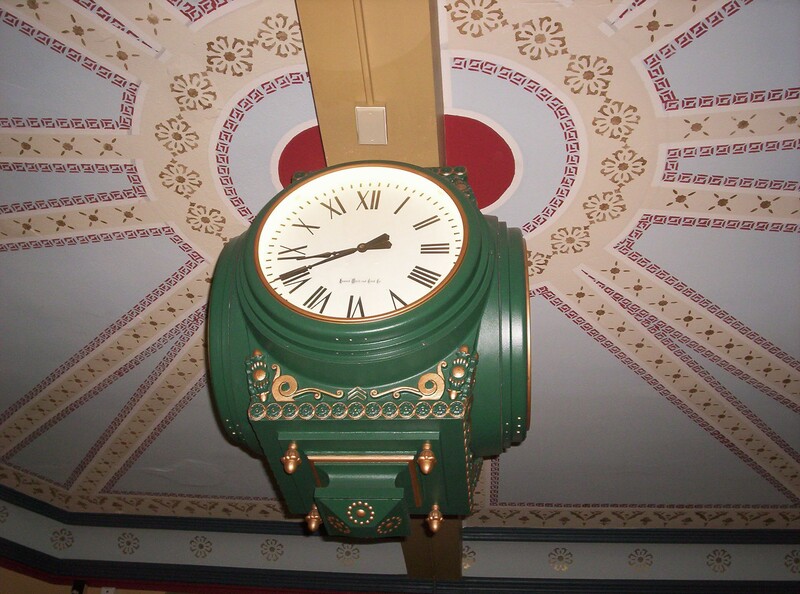 This clock on the ceiling of the first floor is tied to the great clock in the tower. What the big faces outside show, this one shows. What do you say? Good place to end the post? Talk to you soon!